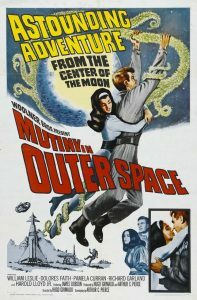 Shot in black and white, Mutiny in Outer Space one of the lesser known 50’s sci-fi, probably because it wasn’t made until 1965, but worry not – it is made in the same mold as most other 50’s sci-fi in regards to script, acting and special effects. An Italian/USA production with all English speaking actors – no annoying dubbing here folks. I find this film to be much more entertaining than the supposed classic with similar storyline ‘It! the Terror from Beyond Space’ made nearly ten years earlier. Well worth your time seeking this flick out. The transfer available is magnificent and much better than some of the commercial 50’s sci-fi titles out there!! By way of comparison, MIOS is much more engaging than other 50’s fare such as The Unknown Terror, The Flame Barrier, or Curucu-Beast of the Amazon. Check it out!! !